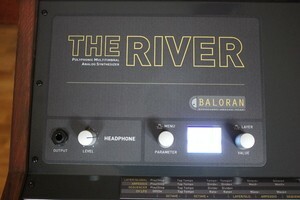 The River, Analog Synth from Baloran. When the analog flows in the stream! The analog revival is in full swing, see for instance all the new devices introduced at the NAMM Show 2018. DSI revealed Prophet Rev2 in 2017, we just reviewed the Korg Prologue and Arturia announced the semi-modular Minibrute 2 series in mid-January, just prior to NAMM. Far away from the Californian turmoil, somewhere in the North of France, between two coal slag heaps, the young two-man company Baloran LTD, recently extracted a real gold nugget in near total secrecy. 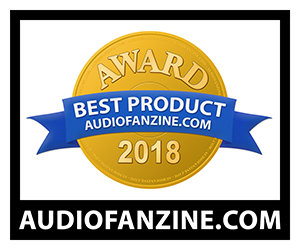 Three years ago, Baloran developed The Triko, a triple high-end programmable analog chorus, which was reviewed in Audiofanzine. Usually, synth designers begin small, with a mono synth, a small sequencer or a DIY module. 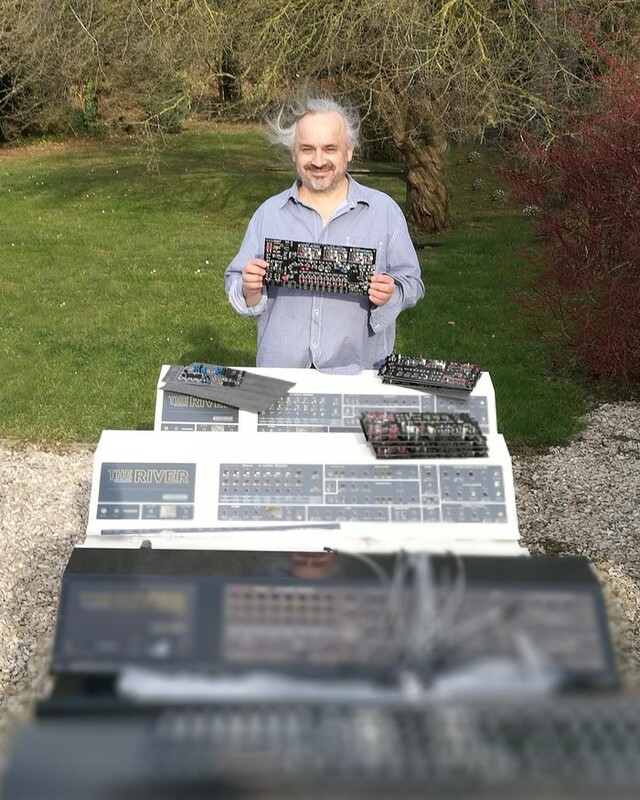 The product choices made by Laurent Lecatelier, company founder and synth designer, have been much more ambitious from the start. 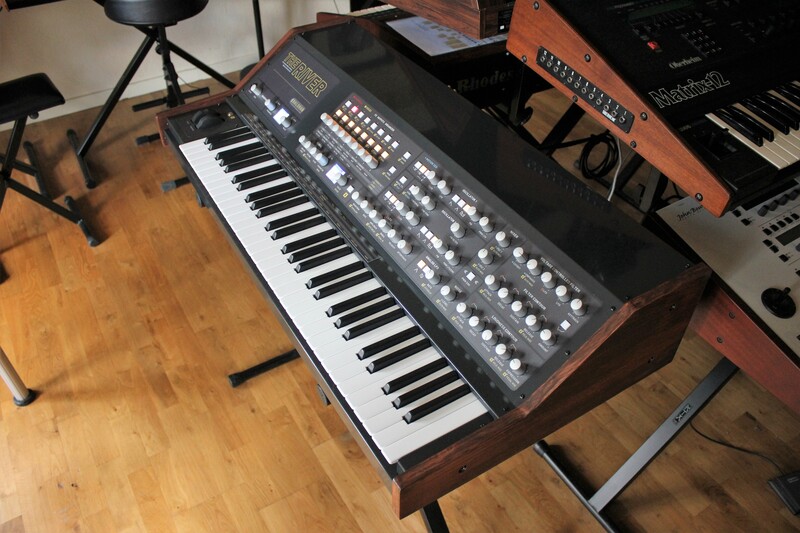 After a three-year development phase and the building of "The Chalet" in the backyard of Laurent’s house, Baloran finally showed the final prototype to the public during the French Synthfest in 2017. Today, we are delighted to present an exclusive review of The River (pronounce “Zeu Riveur” à la French), the first French polyphonic multitimbral programmable analog synthesizer! We will have many opportunities in the course of this review to show how amazing this product is. The River is fully hand-crafted, and with the exception of the SMT components on the printed card boards, all the high quality electronics is based on through-hole components, thus manually soldered. The River is huge, measuring 41 x 20 x 8 inches and weighing 57 lbs. The wooden end caps are hand-finished by Tamara (Madame Baloran) in “The Cuisine” (the kitchen). The deep lacquered steel, numerous knobs/encoders with aluminium caps, lighted push buttons and the rear-panel connectors are all impressive. Baloran has started building the first series of 20 units, which are scheduled to be delivered by end of May 2018. Pre-orders for the second batch will begin in June. When you switch on the instrument, the lighted buttons and both 160 x 128-dot TFT color displays illuminate. And then the fun begins! The River is designed for the player and the sound designer in mind, and offers no less than 39 knobs, 9 encoders, 4 push-encoders and 37 lighted push-buttons for our feverish hands to touch. 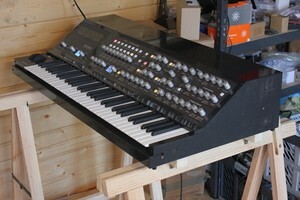 Build quality is excellent: screwed knobs, aluminium caps, screwed connectors, well designed Lexan, selected high-end components, Fatar TP-8 high-level 61-key keyboard (the best semi-weighted keyboard you can find on this planet, and the same one used in John Bowen Solaris and Schmidt Eightvoice synthesizers). 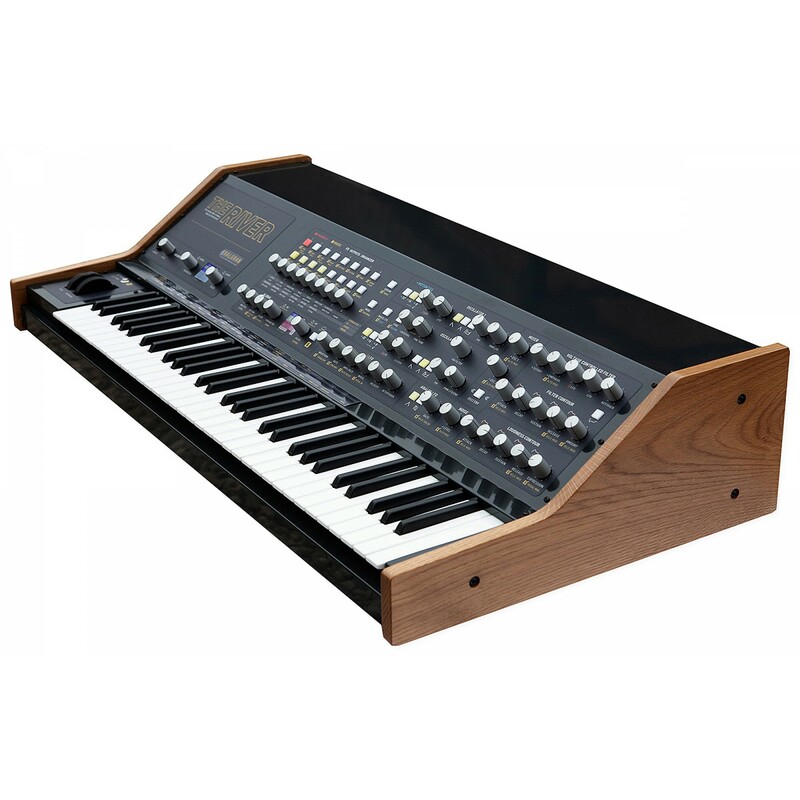 The keyboard is initial- and release-velocity sensitive as well as pressure sensitive, which allows almost unprecedent expressiveness in a poly analog synth (for those who already played the Oberheim Matrix-12). As we previously stated, The River is designed to be player-friendly. The great majority of functions are directly accessible, either by tweaking the front panel knobs, or by combination of keyboard key presses. 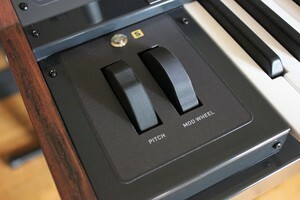 Two Shift buttons allow you to reach the silk-screened secondary functions. 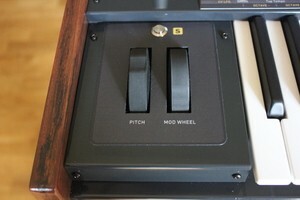 The first is located on the front panel and the second above the pitch bend and modulation wheels. A small removable magnetic piece of Lexan above the keyboard shows every shortcut. 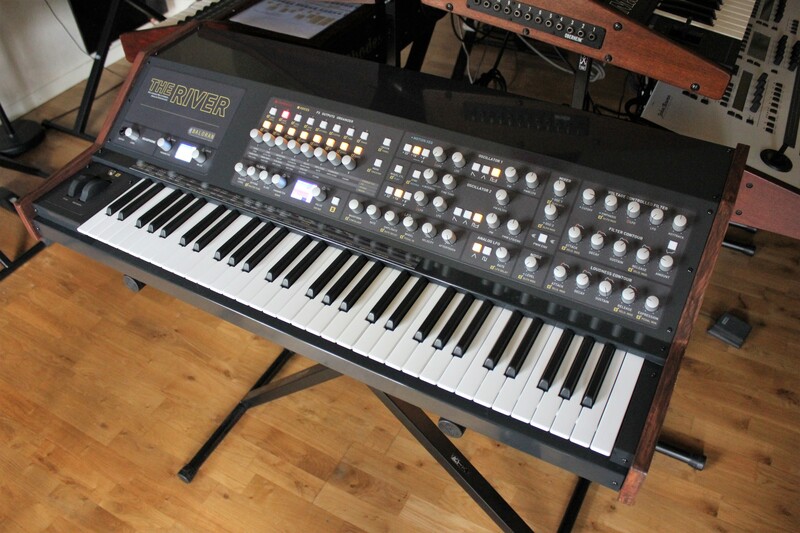 As a result, it's easy to call a sound, assign synth voices to multitimbral channels, adjust level, pan and transposition of individual voices, enter into synthesis, assign keyboard zones, configure keyboard controls, settle effect parameters, program a step-sequence and play an arpeggio. It can seem complex at first but is very powerful once you get up to speed. "I chose to use small displays because I think the user must be able to do without them", confided the designer. Knobs respond to jump or catch mode in the current firmware, but we may see alternate modes in the future (I spoke with Baloran about relative and junction modes). There's no Compare function or a display of both stored and edited values. The former wouldn't have been easy to implement, considering that it has eight independent voices you can assign/unassign/reassign to eight channels at any time, eight channels you can assign/unassign/reassign to four layers, four layers you can assign/unassign/reassign to zones/arpeggios/sequences, you get the picture. Connection-wise, The River is very well featured. 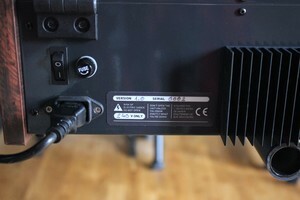 The headphone output is located on the left of the front panel with its dedicated level knob. All the other plugs are screwed on the 7.8 inch-high spacy back panel. 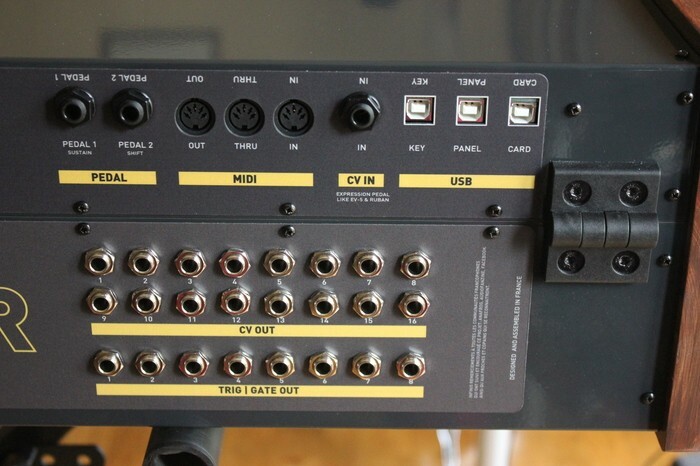 On the top row, you’ll find two main stereo balanced outputs (XLR and TRS jacks), eight individual outputs (TS jacks), two stereo inputs (TRS balanced jack), two footswitch pedal inputs, MIDI In/Out/Thru, a CV pedal input and three USB jacks. The latter allow you to update the firmware of the various vital organs (we will discover later that The River consists of different elements that communicate with each other), one is for global MIDI (memory dumps, CC/NRPN transmission of buttons/knobs during live editing) and the other for the other MIDI commands (notes, physical controllers). It's a little bit confusing to have functions spread on different USB plugs. Under the first row of connectors, you will find an impressive array of three rows of eight plugs: two rows of CV outputs and a row of Gate outputs (when you order The River, you can ask for 1/4" or 1/8" jacks to fit your modular synth system, very cool). CV can transmit Volt/Octave or Hertz/Volt (a future update may allow to settle the CV slope to fit uncalibrated analog external modules). You can also choose Gate polarity. 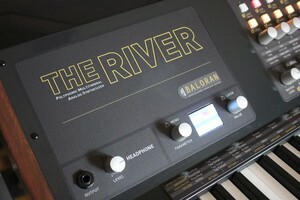 As a result, The River is a powerful MIDI/USB-to-CV/Gate interface, able to communicate with vintage mono, poly or paraphonic instruments, as well as modern ones. Outstanding! The internal gigantic PSU delivers 120 VA of power, more than a Memorymoog! 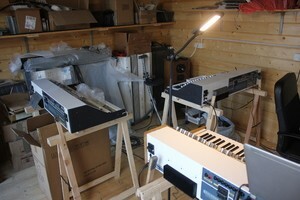 The factory sound bank was designed by pro synth designers who are also synth fans. 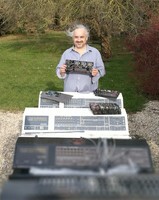 Laurent himself is a big admirer of vintage analog and contemporary synths. 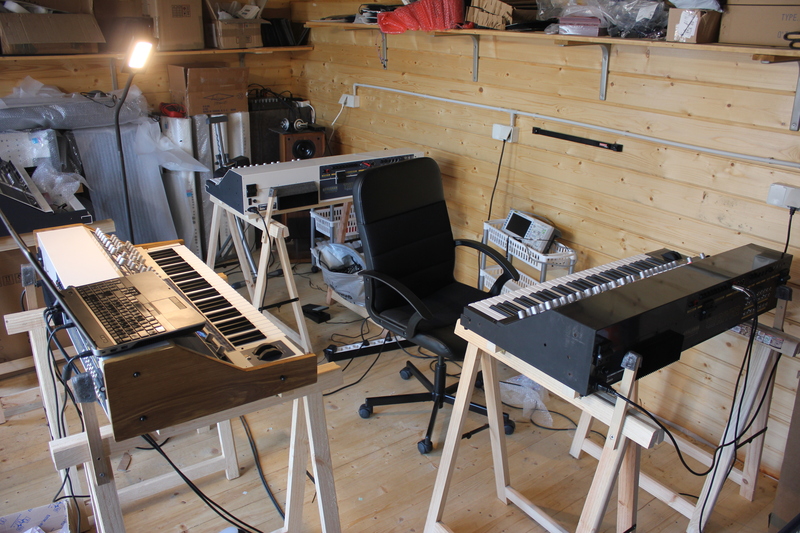 In his studio you'll find a Moog source, Minimoog, MatrixBrute, Microbrute, Poly61, Crumar Multiman S, Farfisa Synthorchestra, Vermona and a self-made clone of the EMS Synthi A—not to mention a bunch of digital synths and samplers. Now that's true eclecticism! He also engaged the talented Barb&Co fellows, aka Stéphane "Barbenzinc" Garganigo and Laurent "Coyote14" Pelletier. They designed a smashing factory bank (SINGLE, FX and MULTI programs – more on this later) that demonstrates the vast sonic territory that The River can cover. 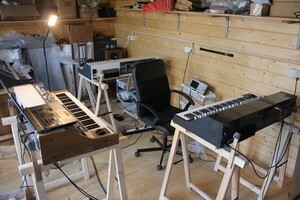 You’ll only find useful sounds, made by musicians for musicians, no filler or aggressive-and-saturated useless rubbish. Laurent and Stéphane sent us some demos of their bank in progress, that we added to our own sounds, for a total of more than 70 sound examples in this review (enjoy!). You can overwrite any factory program and restore them later, directly from The River for Singles and FXs, or via Sysex USB dump for the Multis. After a warmup period of 15 minutes, The River becomes totally stable. The normal working temperature is approximately 33-37°C (91-98°F), based on the oven principle, which makes all the analog crucial components a little sensitive to external temperature variations. If you can’t wait the 15 minutes you can make an Autotune and the internal processor will compensate the rise in temperature (actually each time you make an Autotune, the processor stores the temperature and the CV corrections in each VCO/VCF and learns the behaviour of the synth to make automatic corrections regarding the temperature conditions). The River impresses you immediately with its powerful audio level, and organic vintage sound that's alive, hot, and musical. The VCOs naturally drift like vintage gears do. This is not a digitally simulated drift, it's the real thing, provided by the VCOs and VCFs. 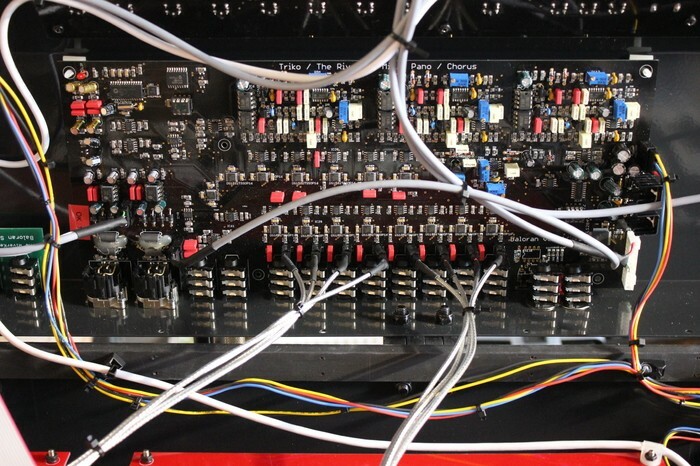 On some contemporary analog synths, you often have to stack two or three voices to get some thickness, but with The River, a single VCO is all you need. 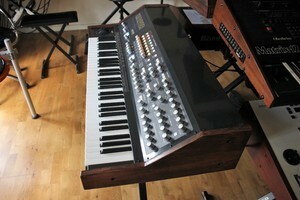 The sonic versatility of the instrument is also very impressive. 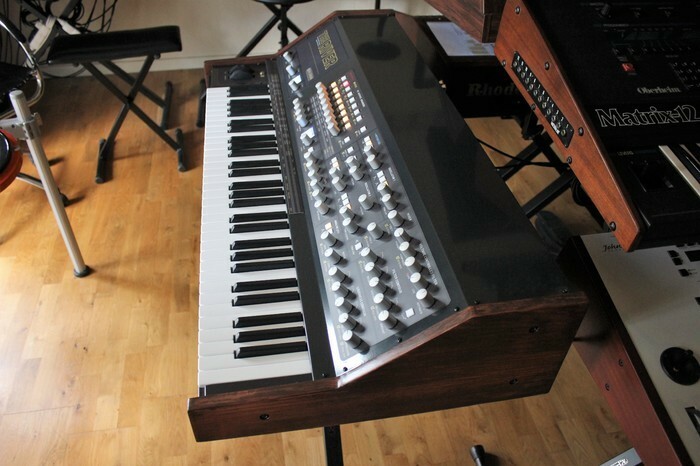 You get beautiful polyphonic sounds (strings, brass, pads), delicate electric pianos, nice-sounding organs, fat or resonant basses, snappy of soft leads (that fluty Minimoog lead! ), bumping analog percussions, evolving wavetables (more on that later) and, thanks to its modulation capabilities, even strange SFX and drones. The breadth of sounds is all the more impressive considering there are only three waveforms in both VCOs and one type of VCF. Envelope attacks are fast enough when you need them to be, with the characteristic click. 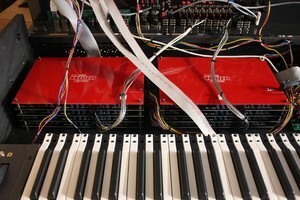 They're certainly not as fast as famous mono-synths like the Pro One or the Minimoog, but quite good nevertheless. 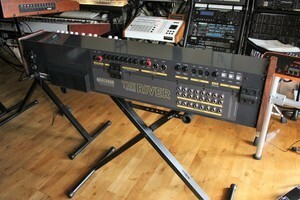 The River's lush synth tones are embellished by the internal triple-analog chorus and digital reverb/delay FX section. 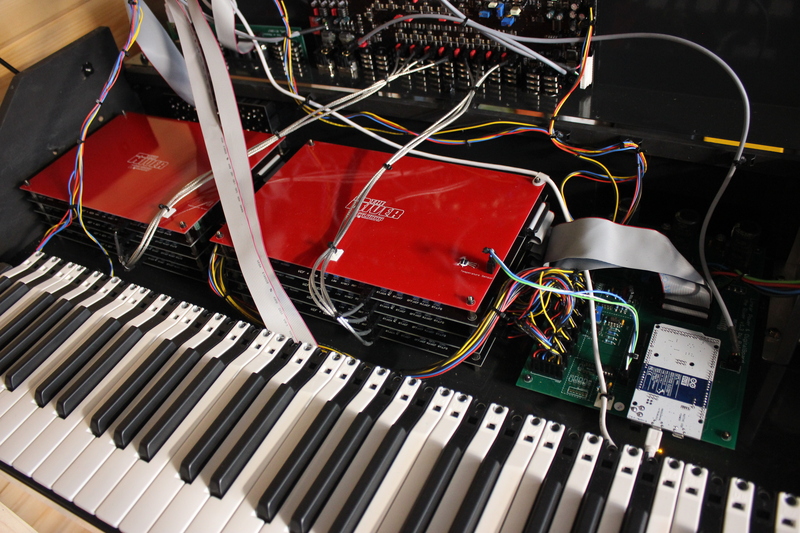 The exquisite keyboard uses initial and release velocity to modulate certain destinations, such as AR segments of envelopes, and keyboard pressure can create additional modulations (DLFO waveforms or AR envelopes). Moreover, you can send the aftertouch to newly played notes only, without affecting sustained notes, which is extremely useful when playing an expressive solo over a quiet pad. And don’t hesitate to use and abuse multitimbrality, four Split/Layer zones, with independent arpeggios or sequences and the ability to drive external machines, whether purely analog, MIDI or USB. Thanks to its outstanding sound and user interface, The River is a true musical instrument. The River, which is an 8-voice polyphonic and multitimbral synth, is organized a bit atypically. It's got eight sound channels in which you can assign one to eight voices, each referring to a Single program (for instance, a one-voice bass sound in channel 1, a five-voice pad in channel 2 and a two-voice Lead sound in channel 3, all other channels remaining empty). The eight voices are routed to individual outputs or sent to The Triko (triple-analog chorus + digital FX), where they are mixed in stereo and sent to the main outputs. All that together constitutes a Multi, which is the unique play mode of The River. When editing sounds, the selected channel responds to the front panel commands; you just need to select another channel to edit it, as simple as a button push (the active Channel button is lit in red). Shortcuts (using the Shift button) allow for editing certain functions for all the active voices in a given channel (for instance transposition, level and pan of the pre-FX mixer). Well done! Now that the eight voices are assigned to some of the eight channels, let’s talk about the Layers. Imagine a sophisticated router named The RiverKey (originally developed independently from The River, just like The Triko which also exists as a separated rack unit). 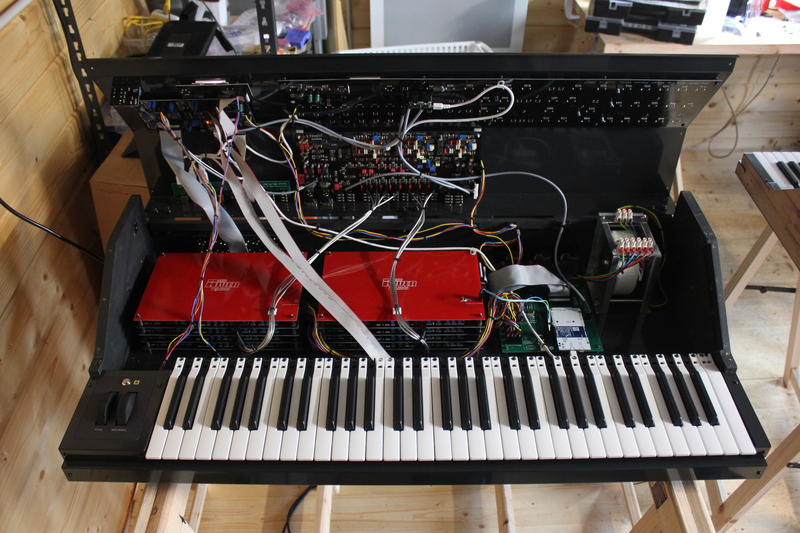 We'll give you the detailed specs later, but the idea is to arrange four independent layers, each which its own source (internal keyboard, MIDI In, USB In), keyboard zone (lower/upper notes), sequence/arpeggio and destination (internal sound module, MIDI Out, USB Out, CV/Gate Out). For instance, in a Multi, you can assign the first two layers to the first two internal channels, trigger an external analog synth with CV/Gate on Layer 3 and a MIDI synth with Layer 4. To make your life easier, the Mode function allows you to choose what's played from the keyboard: the selected channel only (Select), whole active channels at the same time (All) or a Split/Layer combination set in The RiverKey (MIDI). The internal memory can store 160 Single programs (including FX data), 40 independent FX programs, 40 Multi programs and 10 configurations of layers (The RiverKey). 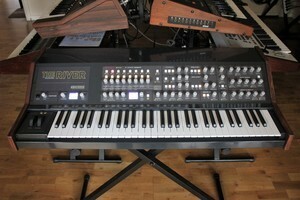 A Multi program stores all synth parameters of each voice (independently of the 160 Single and 40 FX programs), all current FX parameters (loaded with the last loaded Single program) and the current RiverKey configuration (internal/external sound layers with their key mapping, arpeggios and sequences). 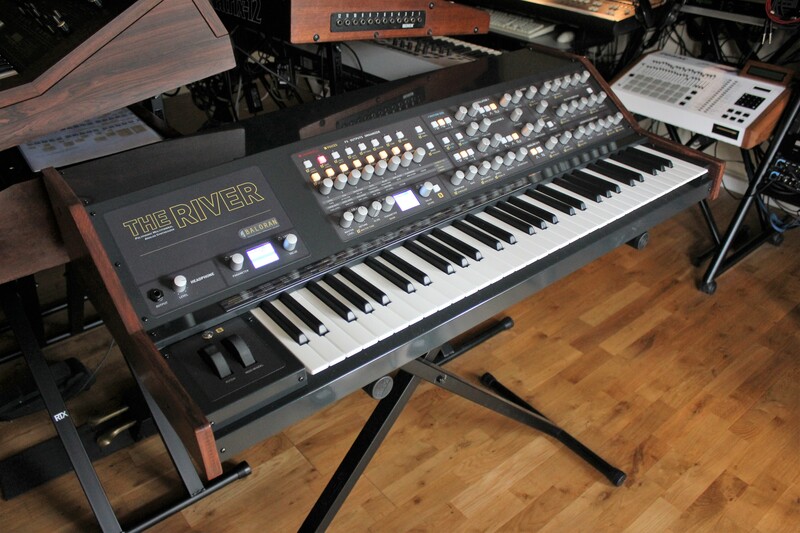 The River has something never seen before on a hardware synth, an auto-save function that seamlessly stores all parameters in the background at regular intervals. Great idea! Each of The River’s voices were designed from the Moog Source. In French, “source” also refers to spring, hence the name “The River." The main point in the design was to keep the genuine sound of the Source while improving the features. 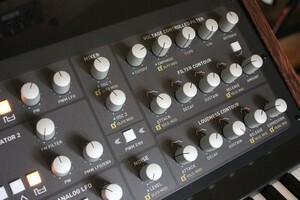 Mission accomplished for the user interface, thanks to its numerous knobs and buttons. It's significantly easier to get around on than the Source, which was equipped with a (fragile) membrane to choose parameters and an optical encoder to edit their values. The River is also a big improvement over The Source in terms of features, adding audio-rate and low-frequency modulations. But let’s go back to the sources of the signal: you’ll find two true-discrete VCOs, each producing sawtooth, triangle or variable-pulse waveforms. The pulse width can be manually adjusted and modulated by the analog LFO, and the VCF envelope can modulate the pulse width of VCO2. Both VCOs have a footage of 32, 16, 8 or 4 to choose from. VCO2 can be detuned from VCO1 in semitones by an octave, or by 200th of semitone (same as The Source). You can even disable VCO2 keyboard tracking, useful when syncing VCOs. Sadly, you can’t change the keyboard temperament. Each VCO pitch can be modulated by the analog LFO and the digital LFO (more on this later). VCOs can also be synchronized to each other: it sounds like hard sync when their frequencies are close, and audio interaction when they diverge and generate chaotic metallic sounds. VCO2 can also modulate the VCF frequency. The two VCOs and the (almost) white-noise generator levels are mixed before going into the VCF stage. Their levels can be modulated by the DLFO. Well done! 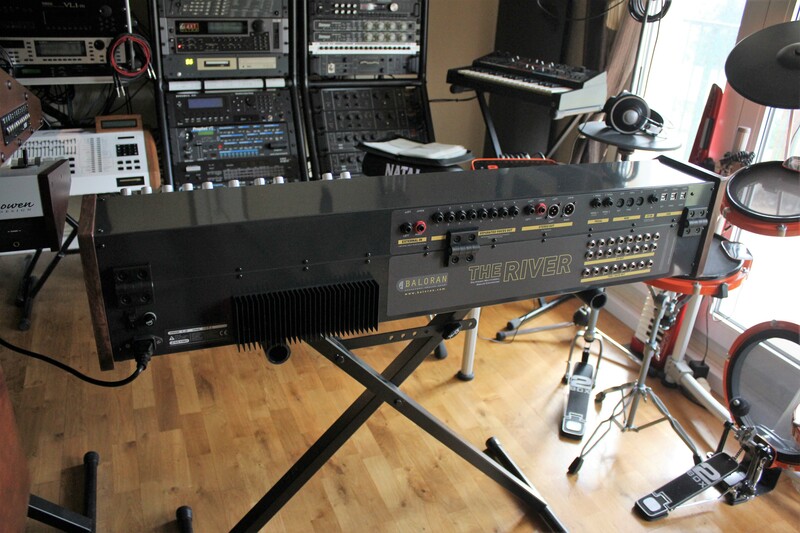 The VCF is the classic 4-pole transistor-ladder filter originally designed by Moog. The name comes from the drawing of its circuits, where four pairs of transistors are coupled, drawing bars of a ladder. It is a resonant filter capable of self-oscillation when the Q (emphasis) reaches 70 to 80% of its maximum value. We do appreciate the precise reproduction of The Source VCF. For one thing, 400 values are available for the cutoff frequency adjustment, as on the original unit, which eliminates step effects. Secondly, the filter self-oscillates with a pure, soft, smooth-sounding sine wave, exactly like on The Source (but very different from the Minimoog filter which can go from saturation to a kind of harshness when self-oscillating). It’s interesting to notice how this filter and the overall design are a perfect fit for polyphonic playing. The filter has a beautiful musicality and is capable of slight saturation when you push the levels of the VCOs (but less than the Minimoog with its feedback circuit). Let’s go back to the Cutoff frequency, which can be modulated by the DLFO, the analog LFO, the key follow and a dedicated analog ADSR envelope with inverter. The Q can be modulated by the DLFO, which is excellent! After the filter, the signal goes to the VCA, with its own analog ADSR envelope (more details about this later). Each voice is then sent to the FX pre-mixer, where it is either routed to its individual output, or mixed before entering the triple chorus (more details about this later also). Voices can be set to unison mode, detuned with a dedicated spread knob and individually paned with the second row of eight knobs. You can also manage note priority (last note, highest interval and smallest interval, which allows you to preserve a voice in order to play a solo bass or lead on top of a chord). Each voice of The River has far better modulation capabilities than The Moog Source, which was not renowned in this area. 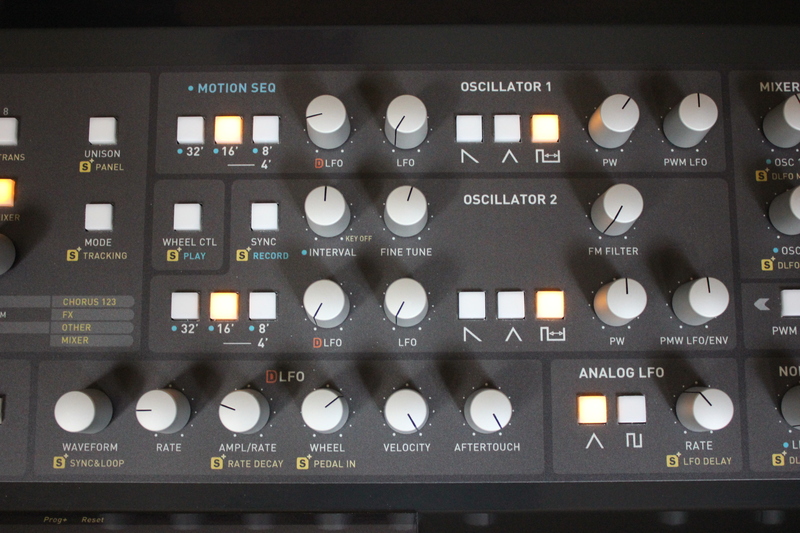 The modulation wheel can act on the level of the LFO and DLFO. The first one is purely analog and available for each voice. Its cycle is always free, which brings interesting phase shifting effects when playing in polyphony, contrary to most of the analog synths which have a global LFO for all the voices. It has triangle and square waves, delay time and rate knobs. It can oscillate up to audio levels. For each voice, the LFO can modulate pitch and PW of each VCO, and also the filter cutoff frequency. Next are two purely analog ADSR envelopes, which are not often found on contemporary synths, especially multitimbral ones. The first is assigned to the filter and can also modulate pitch and PW of VCO2, which is useful to vary the harmonic content of the waveform in real time. The second is assigned to the VCA. Attack and Decay segments can be very short (they click) and go up to 15 seconds. Attack and Release segments can be dynamically modulated by initial and release velocity, respectively, which makes The River a very expressive machine. The envelope-modulation level can also be controlled by velocity and an external CV pedal. Each voice also has its own time-adjustable Glide. 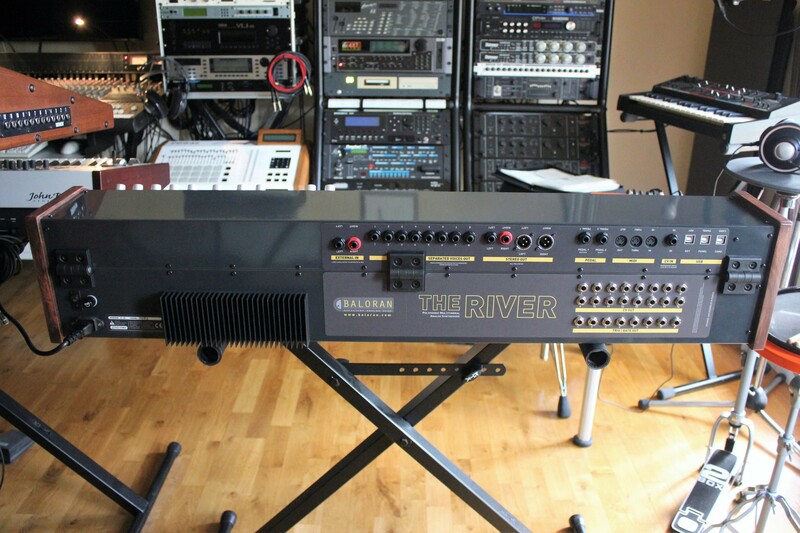 And if it were not enought, The River also features a motion sequencer, which allows for recording the position of certain parameters on 1 to 16 steps. Recording is easy: arm Record mode, keep a key pressed, adjust the knobs and push buttons, and when you’re satisfied, release the key. Repeat this for up to 16 steps and when finished, press Play. 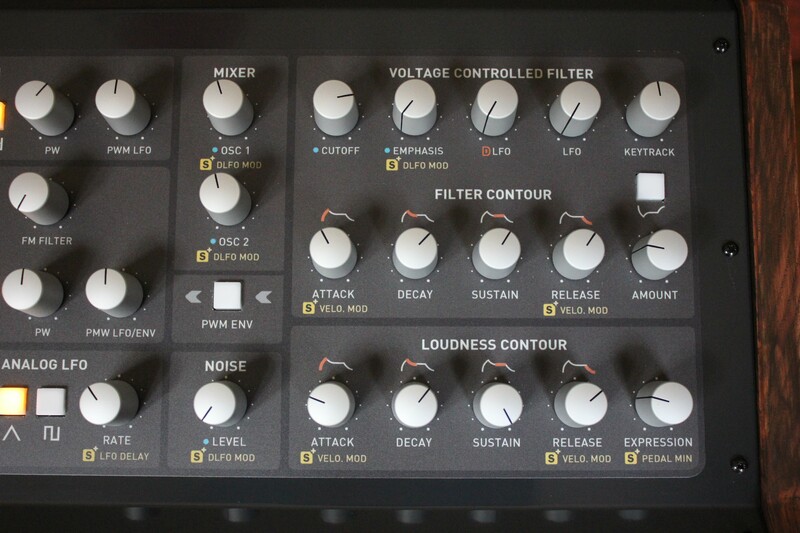 The alterable parameters include VCO length (fun for creating some kinds of arpeggios), VCO2 Interval, VCO2 Detune, VCO1 Level, VCO2 Level, Noise Level, VCF Cutoff, VCF and Q. 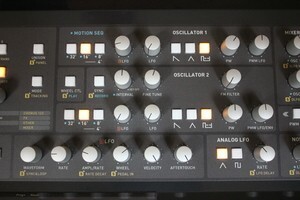 It's easy to create basic wavetables or more crazy effects—the motion sequencer rate can be settled with the DLFO frequency knob. One annoying and unwanted side effect is that changing VCO2 Interval or Detune in real time alters the tempo of the motion sequencer; Baloran must correct this in a future firmware. Smoothing between steps is also missing, but Baloran told us this was not planned because it's much too complex, especially in a multitimbral context. Now it’s time to talk about the DLFO. It is both a digital cycle and envelope generator. It works at a channel level (unlike the analog LFO). The idea is to generate common modulations to all the voices assigned to a given channel, as on singe-LFO vintage polyphonic analog synths. You can choose between several wave shapes and envelope types: modulation (more on this later), sine, triangle, square, ramp, sawtooth, S&H, random, tape-echo drift simulation, AR Up and AR Down. The "modulation" position creates a dynamic modulation depending on the position of the mod wheel, creating a sort of manual envelope. AR Up and Down are envelopes which Attack and Release times can be adjusted along with balance. The cycle of the DLFO can be free running or retriggered on every key stroke; too bad you can’t sync it with the master/MIDI clock—a shame for a digital LFO. The loop function allows you to restart envelopes at every LFO cycle, and the last choice combines retriggering of the cycle and envelope. The maximum speed of the DLFO stays under audio levels at around 16 Hz. A small matrix allows you to separately set the action of the four physical controllers to the amplitude or the speed of the DFLO, related to a balance between these two internal destinations. The DLFO can separately modulate the pitch of every VCO, the level of every VCO, the level of the noise generator and the Q of the filter. 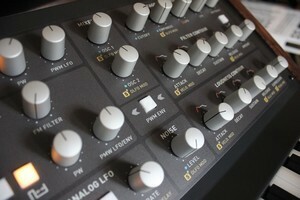 It's an excellent complement to the analog LFO! 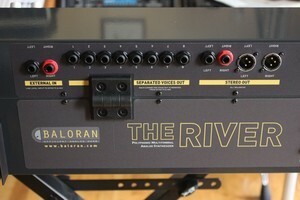 The River integrates an electronic board named The Triko, compound of a triple-analog chorus and a digital reverb/delay. The PCB has been compacted compared to the original module The Triko, thanks to SMT components. Though-hole components were kept for vital parts (sound signal) or when there were no SMT equivalents of the same quality or behaviour, such as plastic or ceramic capacitors. So, what have we got here? Three almost identical choruses are placed in parallel. They get a mono mix from all the voices and the stereo external audio input (dry signals are mixed in stereo and go to the stereo dry bus). In each chorus, you can select the waveform of LFO (none, Sine, Triangle, Square, S&H, Random, Tape or Chorus 2), delay (2 to 25 milliseconds), modulation depth, output level and pan. The Tape position dials in modelled vintage tape echo. The Chorus 2 position allows you to synchronize the speed of the Chorus 1 andor 3 to that of Chorus 2. The Rate parameter of the synchronized choruses sets the phase shift (in degrees). By settling the respective phases of Chorus 1 and 3 to 120° and 240°, and by choosing the sine wave for Chorus 2, you can mimic the triple chorus of famous vintage string machines. Don’t forget to spread stereo positions of each chorus to fatten the sound even more! Chorus 2 has an additional feedback circuit that turns it into a flanger. Excellent! A global LFO adds an extra sine signal to the chorus modulations, with programmable depth and speed. You can also create dynamic modulations with a physical controller (modulation wheel, velocity, pressure, MIDI CC 4-7-11) or the envelope of the input signal, which you can assign to a destination within the effect, with positive-only modulation. Destinations include level, depth and speed of the chorus, global FX level, global dry level and one of the seven effect parameters of the digital FX (more on this below). 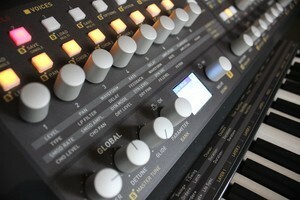 The stereo outputs of the chorus are then mixed to the stereo output or sent to the final digital FX effect, which consists of a DSP that can produce eight algorithms: Tape Echo, Ping-Pong Delay, Clean Echo, Gate Reverb, Plate Reverb, Small Hall Reverb, Hall Reverb and a special "Baloran" Reverb. You can dampen high frequencies, select delay and reverb times, set the number of repeats, modulation waveform, modulation speed, and modulation depth. 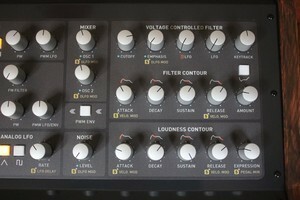 Depending on the kind of effect, you also get a "special parameter" such as level of the second head of the tape-echo simulator, and pre-delay of the reverbs. The number of repeats can reach and even exceed self-oscillation, a well-known effect of tape-echo chambers; this also applies to the reverbs. Modulations have the same waveforms as the chorus; fast modulations are not audible when the algorithm is a reverb. With a delay, you can get realistic tape-drift effects. The quality is very good, with variety and musicality. There are no side effects, no aliasing or aggressiveness. Even without damping the high frequencies, the sound character remains beautiful, not metallic at all. Baloran did a great job in this digital area (as well as in the analog one). 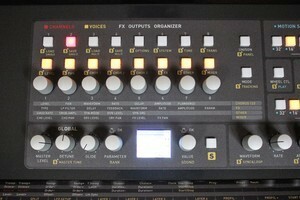 Each chorus and FX has its own output bus with independent level and pan. All the settings are stored within the Single programs or separately, a nice idea to swiftly apply different FXs to a given sound. If you don't want to route specific voices through the FX unit, you have to use the individual outputs. Now let's look at what is perhaps the most impressive aspect of The River: The RiverKey. It's more or less a powerful four-layer router, with each layer having its own input (sources) and output (destinations). 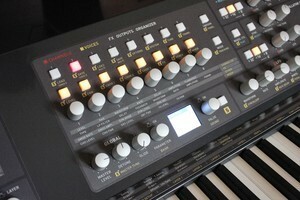 You can define the keyboard zone, arpeggio or step-sequencer pattern for each and there is a global CV LFO. 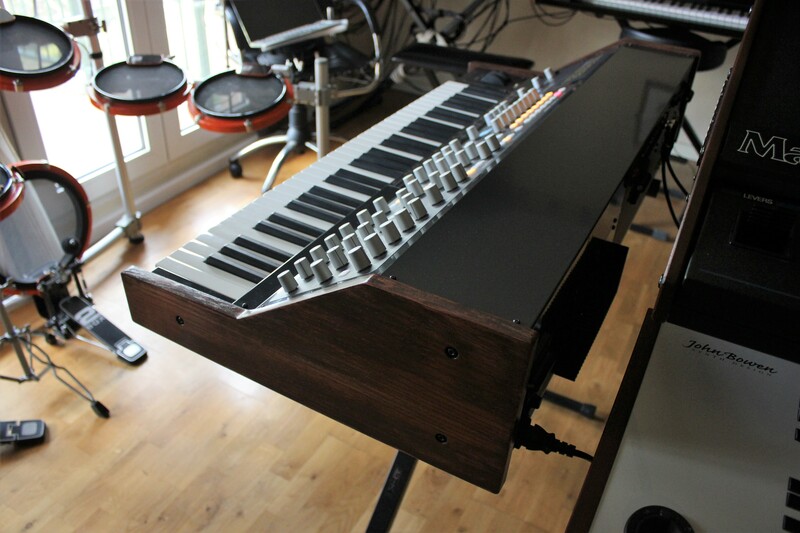 Some parameters are directly programmable from The River using the Shift + keys combination. All the parameters are accessible using dedicated software (Windows 7/10 compatible only for the moment), where you create profiles and send them to The River using USB (you can send 10 profiles, which is enough to manage a studio or live configuration of analog and digital gear). The River stores the current profile along with the Multi, which makes it easy to recall a full configuration. The parameters for each individual layer of The River include Layer Activation, Key Zone (lowest /highest Key), Octave, Transposition, Channel (internal/MIDI/USB), Clock Send and MIDI Program Change. 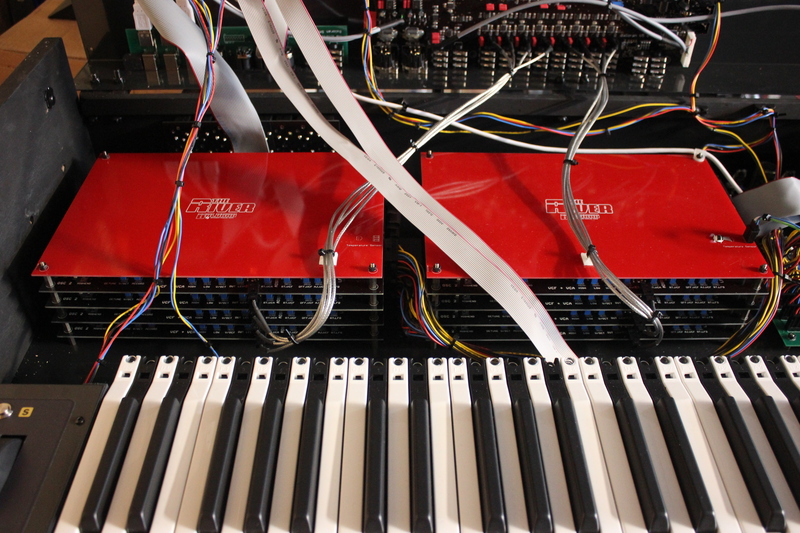 As mentioned, each layer has an arpeggiator, whose parameters include: Tempo (Tap touch), Time Division, Pattern (11 types, mono and polyphonic), Octave Range (1-5), Playing Order (high, low, random), Latch Mode and Gate Time. A special mode allows you to transpose an arpeggio in real time by playing only one key. The key will not be arpeggiated but will set the transposition range. 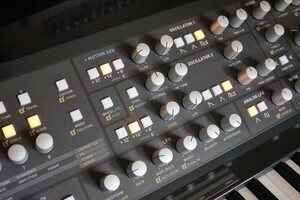 There’s also a step sequencer with its dedicated parameters: Tempo, Time Division, Playing Order and Gate Time. Each sequence can hold up to 48 steps that can be input in real time or step by step. Polyphony is limited to four notes and you can add silences (but sadly no doted notes or slide/auto-bend) in real time. Quantization is automatically applied according to gate time. Once the sequence is programmed, you can’t edit it, which is a shame. Baloran would you please find a way to navigate through the steps and edit them (at least key or silence change/delete/insert)? 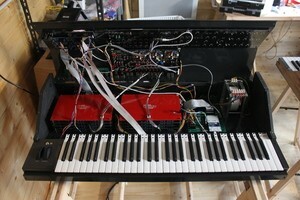 You can transpose the sequence in real time with the keyboard or via an external MIDI/USB unit. All these parameters are stored in the current profile. A word now about the global parameters of the profile, which include Velocity Curve, Pressure Curve, Play/Stop (when arpeggios or sequences are active), Tempo (with Tap), Swing and CV LFO. 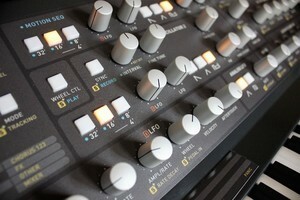 The latter allows you to send an LFO in a given CV output to modulate an external analog module. Its parameters include Activation, Tempo, Waveform, Modulation Level, Vertical Waveform Offset and Cycle Phase Mode (either free or retriggered by each key press). Many other parameters are editable via the Windows software, but the list is too long to include here. 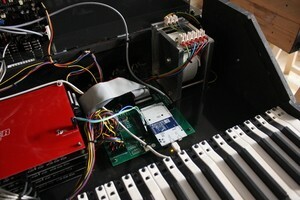 The first thing is to define the source of the Layer, be it internal keyboard, MIDI Input or USB. Next, define the Destination, choosing from Internal Sound Channel, MIDI, USB or CV/Gate output. Given that there are eight multitimbral Channels for four Layers, we suggested that Baloran invert the assignment of internal destinations allowing for defining the Layer number at the Channel level, which would allow for stacking several Channels in the same Layer by consuming one Layer only. That would not be trivial to accomplish, but Baloran promised to consider it. 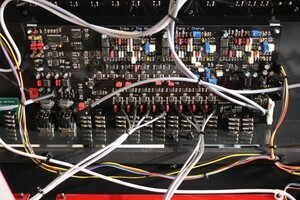 Next you define the number of assigned voices, MIDI filter (physical controllers, CC) and in the case of CV/Gate destination, the sending mode through the output jacks (mono, polyphonic = X CVs for X gates, paraphonic = X CVs for 1 gate), the CV communication protocol (Volt/octave or Hz/Volt) and gate polarity. The editor shows the automatic assignment of sources to the available CV/Gate in real time, for the four layers. Of course, you can modify the assignment to your taste. Finally, the editor allows you to manage the profiles of four Layers. You can name them, manage up to ten profiles in a configuration, and dump them to the internal memory of The River. And there we are! It's hard to find words that do justice to The River. The vision of its designer has been realized: the vintage sound that we love, undeniable fire power, very original features, a design that makes you want to play and toggle and a great piece of hand-crafted hardware. Laurent is also a very nice and kind person. Most of our suggested changes are in the software domain. A second filter would be nice, although the versatility of the machine is nevertheless surprising. Some users will also miss being able to route the audio input to the filter, which is not intuitive to control in a polyphonic multitimbral context. When he was emotionally waving goodbye to the first unit when we picked it from his house for this review, Laurent made clear that his goal was to design a true musical instrument, and he has succeeded unequivocally. Much more than a musical instrument, The River is an instrument of pleasure which clearly deserves our « Best Product » Award! During the previous test of The Triko, Laurent told us about his dream to move forward on its “big project," speaking of The River, even to complete it. And now he's done so. When did you begin to think about The River? First consideration began in March, 2014. 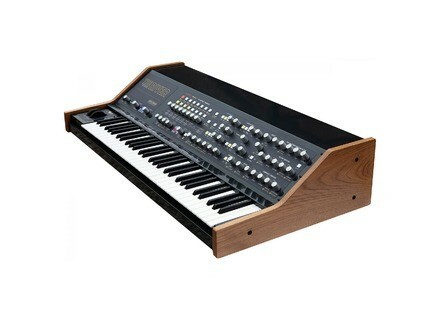 I'd purchased a Moog Source a few months before, and immediately felt enormous love for that sound. But the huge level of maintenance required by that instrument caused me to dive inside the service manual, which gave me the idea to design a polyphonic version. What were the big steps of the project? At first the construction of three voice boards and a panel on prototype plates, which allowed me to validate the project and publish the first demos on SoundCloud. That phase was very fast, hardly three months. One year later, the main sections were validated. Then I designed The Triko and The RiverKey as separated projects; the marketing of The Triko put The River in standby but allowed me to create the Baloran LTD company and fund (a little bit) the developments. 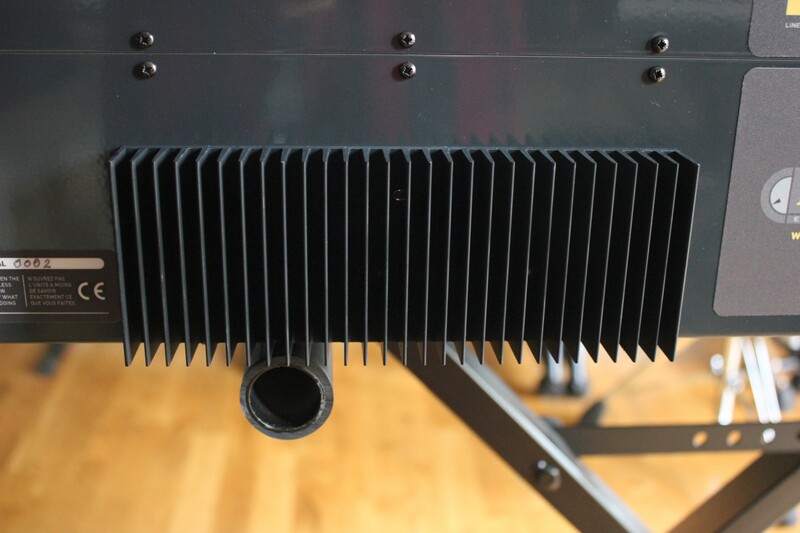 The following two years saw the finalization of the panel and the first case, then the complete redesign of the voice boards (transfer to SMT components with the exception of the high-end parts, replacement of the CA3080, new routings… same for The RiverKey and The Triko). 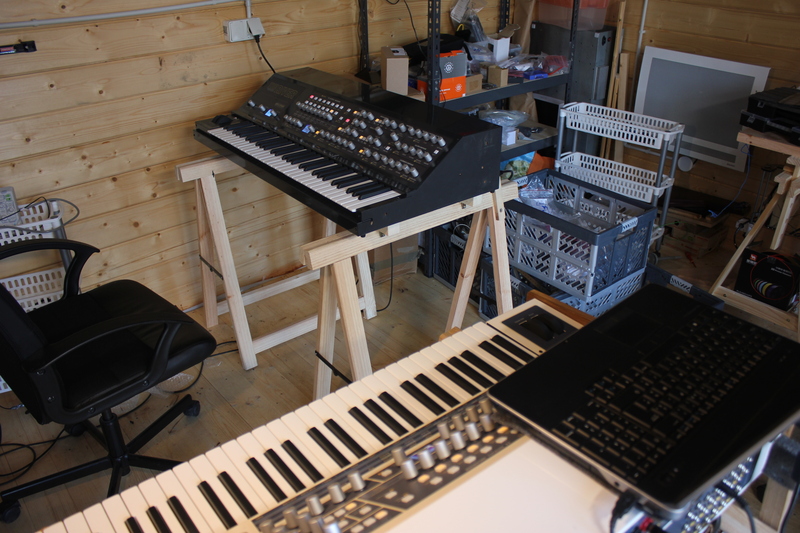 Then I was invited to the French SynthFest 2017 edition, which drove me—in a crazy period from the end of 2016—to create a new case, new screen printing, finalization of the architecture, and validation of the prototypes. Since the middle of 2017, the marketing of the first batch has plunged me into period of madness that has still not slowed down. Which synths influenced you most? 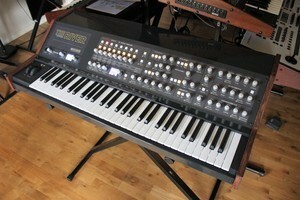 I can't say that any synth influenced me except The Moog Source. The machines that I’d kept the longest in the studio were the JD800 and the Ensoniq ESQ 1. My inability to escape from progressive, psychedelic and electronic rock motivated me to look for these sounds. What were the main difficulties to overcome? What are your big satisfactions on this project? Sound! I still play with The River for hours! I was also very touched by how the French-speaking community welcomed the project. I received so much goodwill and there were three days during the SynthFest 2017 where I could not touch ground. 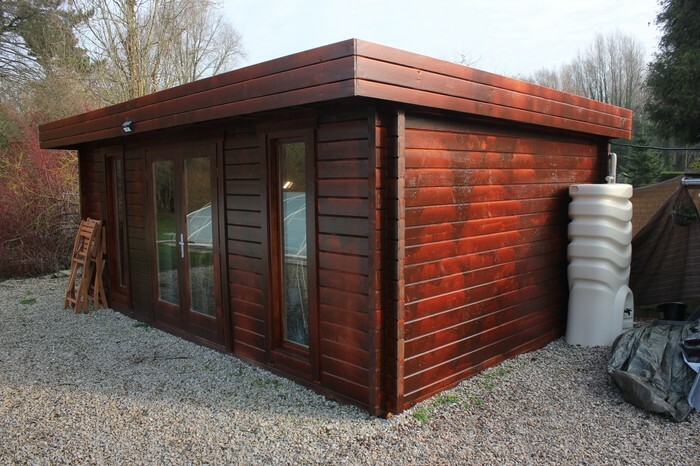 Today, even if the difficulties have not ended, it makes me proud to see new units of The River multiplying in the Chalet and to observe the reaction of the visitors in front of the instrument. 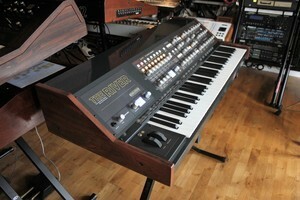 What advice would you give to those who want to design a new synth? It’s difficult to give advice. You and your family must be ready to face this wonderful nightmare. Some holidays please, before batch number 2 starts! Then I hope to make the small Baloran LTD company prosperous in 2018, so that it can become my full-time job. I already have some ideas of projects with the convergence of analog under digital control.